The caves themselves are at Mogao (or Peerless), some 15 miles from the ancient military garrison and trading center of Dunhuang. Of the surviving 735 grottoes, 492 date from the fourth to 14th centuries, decorated with 2,000 sculptures and almost 500,000 square feet of wall paintings. These are the main attraction, open to visitors on a rotating basis. They offer an unparalleled compendium of Chinese art history—a taste of which the Getty gives us with replicas of three stylistically distinct caves. From dense, predominantly red compositions in Cave 275 (the original is fifth century) we move to the vibrant, airy Cave 285 described above, and end surrounded by the graceful elegance of High Tang in Cave 320 (original eighth century). But there’s more. In 1900, a Taoist monk discovered a walled-in chamber filled with more than 50,000 manuscripts, silk paintings, banners, ritual objects, embroideries, sketches and art supplies, all from the seventh to eleventh centuries. Not understanding their value, the monk sold the bulk of this “Library” to savvy foreign explorers. The curators have gathered some 40 items from collections in the United Kingdom and France in a remarkably succinct display, mostly of manuscripts and paintings that illustrate how cosmopolitan and wealthy Dunhuang was in its heyday and how talented its artists. A particularly compelling painting is in a slim vertical format used for banners that Buddhists hung as acts of devotion. From about the eighth or ninth century, it features three scenes set in the mountains: The future Buddha, Prince Siddhartha, bids farewell to his groom and horse; leans forward to have a courtier shave his head; and sits in meditation so long that birds have built a nest on his head. The background features rare examples of early Chinese landscape painting, while the foreground treats us to a delightful metaphor for meditation. In the first two vignettes, clumps of surrounding trees are solid; in the last, they are ghostlike, literally fading away as the ascetic pursues inner truths. The Library also yielded information on how artists worked, from the materials used to their techniques. The latter included shortcuts—we see a 10th-century drawing partially made with a stencil, an eighth-century scroll with rows of stamped images of a seated Buddha. We also see one of the world’s first printed texts, a copy of the Diamond Sutra dated 868, in which the Buddha stresses repeatedly that sharing scriptures brings “immeasurable, incalculable, and boundless merit and virtue.” A photographic display on the rediscovery of the site by an artist in the 1940s further underscores the notion that copying sacred images and texts is not a cheat but a boon. This emphasis on modes of reproduction places both the cave replicas and a 3-D film of a fourth cave as part of a continuum. Of the two, I prefer the replicas. The film, in which painted sculptures from another Tang-dynasty cave draw close and recede as a sonorous voice narrates, provides useful information, but ultimately feels staged and remote. Far more engaging are the physical copies, which allow us to respond to the architecture, proportions and paintings all at once. As in Mogao, only a few can enter at one time, and there is no lingering at will. This may be why the handouts point out only three features per cave. This feels inadequate given the richness of the imagery, but there are workarounds. 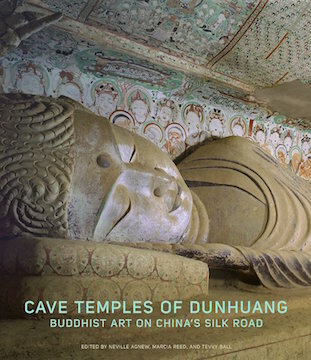 To supplement the information presented with the display of Library artifacts, check the Dunhuang Academy’s website. And get more than one timed ticket for the caves. You’ll want to go back.